Reach out to some of the most highly sought-after contacts in any industry: those working in advertising and marketing. Market to marketers, network with this diverse group, or find the right team for your company with this accurate, ready-to-download email database. Wouldn't it be great to have a mailing list that consolidates contacts at marketing firms, advertising agencies, and others in the industry into one accurate, organized, and easy-to-integrate contact directory? We think so! That's why we built this data product, which you can download, pull into your CRM, and use to email leads right away. 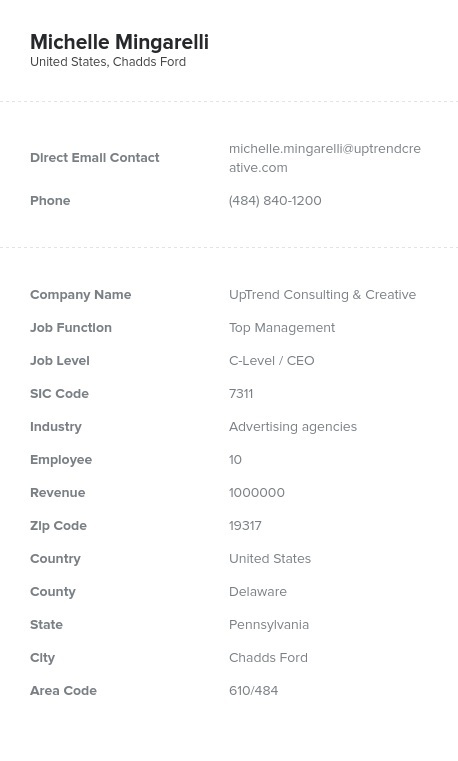 Marketing and advertising companies can be found easily with our collected data, which is updated daily. Connecting with the right people is easier than ever because this product includes all of the information you need to talk to people in marketing and advertising: emails, titles, numbers, addresses, names, and more. Our goal is to help your business market to and connect with other businesses by offering information about the key contacts in your B2B niche. With this marketing and advertising database, you'll be able to communicate using accurate, detailed information. Get started right away with this pre-built product, or use our list-builder tool, which allows you to customize your own list of targeted sales leads. Bookyourdata.com offers tools for businesses to market to marketing agencies, find key advertising contacts, and network with their niche. Look up the right people after you buy this marketing and advertising agency email list today!